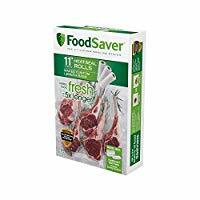 FoodSaver Vacuum Sealer Bags were one of our highest rated vacuum sealer bags scoring 4.25 out of 5 stars. These bags were higher than average from a quality perspective with thickness of 3 Mil (front) 11.5 Mil (back). 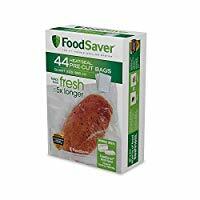 The FoodSaver bags were the second thickest bags we reviewed, the only bag thicker was from CaseKix. 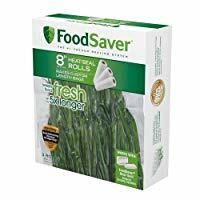 The FoodSaver bags were not very economical compared to other brands, the an average cost is $0.39 per bag for 1 quart sized bags, and $0.64 per square foot for 11" bag rolls. This makes them almost 55% more expensive than our highest rated brand from OutOfAir. You have to decide if thicker bags are worth the higher price for you. These bags are also Universal Vacuum Sealer Bags and are compatible with most brands of vacuum sealers. Do FoodSaver Vacuum Sealer Bags work with other brands of Vacuum Sealers? 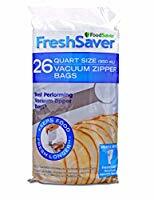 Yes FoodSaver Vacuum Sealer Bags work with most other brands vacuum sealers, they are Universal Vacuum Sealer Bags which means they work with most brands of vacuum sealers, use the Comparison Chart for more information. 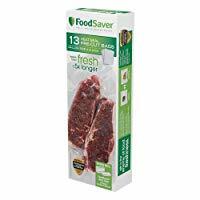 How thick are FoodSaver Vacuum Sealer Bags? 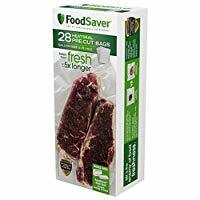 FoodSaver Vacuum Sealer Bags are 3 Mil in the front and 11.5 Mil in the back, this was the second thickest bags we reviewed. What sizes do FoodSaver Vacuum Sealer Bags come in? 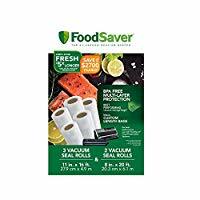 FoodSaver Vacuum Sealer Bags come in the following sizes: 1 pint (28 count), 1 Quart (44 count), 1 Gallon (28 count), 8"x20ft (3 rolls), 11"x16ft (3 rolls), Combination pack of 8"x10ft (2 rolls) and 11"x16ft (3 rolls). 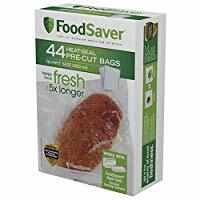 Are FoodSaver Bags Freezer Safe? Yes all FoodSaver Vacuum Seal Bags are Freezer Safe. 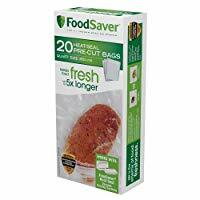 Do FoodSaver Bags work with Sous Vide Cooking? Yes all FoodSaver Vacuum Sealer Bags will work with Sous Vide Machines. OutOfAir Vacuum Sealer Bag and Rolls are our highest rated Vacuum Sealer Bags, they are durable, high quality, and are available at great price. They are a Universal Vacuum Sealer Bag and will work with most brands of Vacuum Sealers.